Uma Bharati VP,Prabhat Jha fInds place but surprisly Shivraj left out,Varun Gandhi gets G Secretary,Amit Shah too inducted . Amit has court cases but his induction is attributed to Narendra win.Hindutva shines ,Yashwant Sinha, Ramjethmalani, Mahesh fades out.BJP with their inner differences amongst their top leadership tough time for RajnathBJP chief to work with Rss idealogue of hindutva likely to emerge in coming elections.posterboys of Modi finding place thus bank upon Modi magic. BJP team becomes important for the saffron party to tread with ease in the ensuing G Election and nearly ten assembly election around.BJP chief , President Rajnath Singh could not announce his team due to consensus differed on induction of two leaders Amit Shah from Gujarat and CM Shivraj Singh the later is backed by Advani and Sushma and former by Naredendra Modi.Possibly BJP chief Rajnath Singh may be able to get consensus on two names and pronounce today his Organsiation structure. General election round the corner does make the team BJP an important political gameplan for brand BJP to embattle the ballot war to achieve nation governance . Thus we are advancing into state of fluid and the political functionary do bring aberration in the dynamics of political ideation where individuals ,leadership,and party gets takes front seat,the national voice,nation ideation,and ultimate power to move ahead with other developed nation reach low ebb.It is therefore lurking thought prevail ,bio polar party system may end in India but either of two parties may give outside support in forming the government to regional parties with adequate numbers of senate or one party loss could be gain to other major brand. Narendra Modi gets inducted into parliamentary board of eleven members with prominent role and likely to play an important role in campaign of nextGeneral election.Modi shall be leading the party with modern tech and with his team thus paving way for RSS to put their men in vanguard of electoral battle to follow in ten states and general election. Putting in frame the fact of ascending heights in political arena, CM’s who have done welfare and masses work in the past with ease and determination plus vision has been rewarded with coveted post either in Cabinet, two apex post, PM and President in time of coalition call. Hence branding of a politician in individual capacity is very essential with flair of ethics and truism paves his way onto the two coveted apex post of this great nation. The contenders are essential features of politics in building leadership for the cause of nation running in dignified manner,there lies the hopes of billion plus people on their righteous attitude.How are they recognized ? By their fan following ? By their influence they exert with money ? Or it is shear when one achieve confidence of all classes of people.The holistic strata of the society look upon to this man essentially a gentleman on whom mass build the trust. Presently we term him empirically with “PM Material” ,these special beings or species need to be present in all political parties which help the nation to take strides in various streams of development.During Ensuing election year,the debate of leadership quality,with the dilution of each other action are put on debate by various group . In an era of all around developments, education, communication moot point of selection of leaders remain with the masses which spring surprise to all of us. Rajnath Singh, former prime minister Atal Bihari Vajpayee, L K Advani, Murli Manohar Joshi, M Venkeya Naidu, Nitin Gadkari, Sushma Swaraj, Arun Jaitely, Narendra Modi, Anant Kumar, Thawar Chand Gehlot and Ram Lal. Rajnath’s new team comprises vice-presidents: C P Thakur, Jual Urao, Sadananda Gowda, Mukhtar Abbas Naqvi,S S Ahluwalia, Balbir Punj, Satpal Malik, Prabhat Jha, Ms Uma Bharti, Ms Bijyo Chakravarti, Ms Lakxmikanta Chawla, Ms Kiran Maheshwari and Smriti Irani. BJP leader Mukhtar Abbas Naqvi said that due representation has been given to women, youth and backward classes in the the new BJP team. Egypt has issued an arrest warrant for a popular Egyptian satirist for allegedly insulting Islam and the country’s president Mohammed Morsi, raising fears of a crackdown on freedom in the region, Media reports . Earlier, Bassem Youssef faced several complaints against his show ‘El Bernameg.’ The arrest warrant comes following the detention of five prominent pro-democracy activists in an apparently widening campaign against dissent. Last summer, Egyptian authorities arrested a minority Coptic Christian teacher for allegedly posting cartoons on Facebook that insulted Islam – charges that are becoming a common theme in a country ruled by an Islamic government. Pakistani Taliban claims Peshawar attack that killed 10 near US Consulate. Cypriot President Nicos Anastasiades said on Friday the island’s bank crisis had been “contained” following a tough bailout deal with the EU. “We have no intention of leaving the euro,” media quoted Anastasiades as saying in Nicosia. “In no way will we experiment with the future of our country,” the president added. Cypriot central bank has announced that all domestic debit and credit card transactions are now unrestricted. On Thursday, Cyprus reopened the country’s banks following a 12-day shutdown, but imposed a 300-euro limit on all cash withdrawals. The Cyprus Stock Exchange extended its almost two-week shutdown, and will remain closed until April 1. The measures were introduced to deal with the worsening financial crisis in the country. Cyprus Telecommunications Authority ‘Cyta’ will be offering free national calls to subscribers, both fixed line and mobile, for the month of April, said the company. Cyta added that it would not be disconnecting any of its subscribers who have not been able to settle their bills following the two week closure of the banks. The organization will review this decision on April 15 in light of the situation at the time. This measure is intended to help ease the blow from the economic crisis on the island. French troops to stay in Mali through end of 2013:Hollande. President Francois Hollande has said French troops will stay in Mali to fight Islamist militants at least through the end of 2013. However, the first of the more than 4,000 French troops in Mali will pull out in late April, Hollande said on France-2 television Thursday night. About 2,000 soldiers will remain deployed in the former French colony by July. By the end of the year, “1,000 French soldiers will remain,” the president said. The French troops could become part of a UN peacekeeping operation in Mali. Chinese Foreign Ministry spokesperson Hong Lei called for an easing of tensions on Friday after North Korea put its missile units on standby to attack US military bases in South Korea and the Pacific. The North’s move came after the US flew two nuclear-capable stealth bombers over the Korean peninsula. Berlusconi ready for coalition with Italy’s center-left, opposes technocrat govt Former Italian Prime Minister Silvio Berlusconi has said he is ready to support a coalition government with center-left leader Pier Luigi Bersani. Berlusconi met President Giorgio Napolitano on Friday, after Bersani failed to form a government and end a month-long political deadlock since elections last month. Berlusconi rejected another technocratic administration like the outgoing one led by Mario Monti, Reuters said. Roberto Maroni, leader of Berlusconi’s Northern League ally, also rejected the technocrats, saying it would be better to hold another election. French President Francois Hollande has stated that the EU arms embargo on Syria would remain in place as long as France could not be guaranteed that weapons deliveries to the Syrian rebels would not “fall into the hands of terrorists. ” France and Britain have attempted to push for a relaxation of the embargo, which expires on June 1. Sicilian regional government in Italy has withdrawn permission for the US to build a satellite station aimed at boosting communications capacity for the US military and its allies, its governor said. The ground station designed on a part of the ultra-high-frequency satellite network Mobile User Objective System (MUOS). Government overturn is on possible health risks, such as fears of cancer from the station’s electromagnetic waves, had provoked protests on the island. The demonstrations could have compromised operations at Sigonella, a U.S. naval base in Sicily, the Italian government said. Rome stated that the decision of the regional government of Sicily, which in January issued a special decree to suspend work on the station’s construction, harms the strategic interests of the country. MOUNTAIN VIEW: A groundbreaking solar-powered Swiss aircraft is ready to make a coast-to-coast flight across the United States, its creators said Thursday. The experimental Solar Impulse plane, which has made several trips since its maiden flight in 2009, will take off on May 1 on a transcontinental tour split in five stages. "We are ready to do this flight across America," said Solar Impulse co-founder Andre Borschberg during a press conference at a hangar in Mountain View, near San Francisco. Borschberg said the flight is being split into multiple stages for security reasons, emphasising nevertheless that the single-seat aircraft was technically capable of flying non-stop across the United States. A non-stop flight would take approximately three days travelling at the aircraft's cruising speed of around 43 miles (70 kilometers) per hour. "We have limited ourselves to fly a duration maximum of 24 hours," said Borschberg, who will share the piloting duties with Solar Impulse president Bertrand Piccard. Weather conditions permitting, the Solar Impulse will take off on May 1 and is scheduled to make stops in Phoenix, Dallas and Washington before arriving in New York in early July. The plane will spend up to 10 days at each stop on its journey in order to showcase its technology to the public, schoolchildren and students who will also have a chance to talk with the pilots. "The people will be able to follow the mission, to speak to the pilot, to ask questions," Piccard said. "We would like to inspire students, schoolchildren, inspire as many people as possible to try to have the spirit to dare, to innovate, to invent." The Solar Impulse project was launched 10 years ago before the plane, which weighs about the same as a family car but boasts a wingspan roughly equivalent to a Boeing 747, made its first flight in 2009. In 2010, the plane was flown 26 hours non-stop in order to demonstrate that its photovoltaic cells could soak up enough solar energy in daytime to power the plane at night. A year later, the plane made its first international flight between Belgium and France before it set off on a 1,550-mile intercontinental flight from Madrid to Rabat in June. Borschberg and Piccard are planning an around-the-world flight of the plane in 2015. India and Liechtenstein have signed a Tax Information Exchange Agreement (TIEA) today at Bern, Switzerland. The Agreement was signed by Ms Chitra Narayanan, Indian Ambassador in Switzerland from Indian side and Madame Doris Frick, Ambassador of Liechtenstein in Switzerland on behalf of Liechtenstein. • It is based on international standard of transparency and exchange of information. • Information must be foreseeable relevant to the administration and enforcement of the domestic laws of the Contracting Parties concerning taxes covered by the agreement. • There is a specific provision that the requested Party shall use its information gathering measures to obtain the requested information even though that Party may not need such information for its own tax purposes. • There is a specific provision for providing banking and ownership information. • It provides for the representatives of the competent authority of the requesting Party to enter the territory of the requested Party to interview individuals and examine records. • The Agreement has specific provisions for protecting the confidentiality of the information obtained under the Agreement. Information is to be treated as secret and can be disclosed to only specified person or authorities, which are tax authorities or its oversight body. However, the information may be used for other purposes with the express consent of the Competent Authority of the supplying State. • The Agreement shall enter into force one month from the later of the notification. On entering into force, information can be exchanged if it pertains to taxable periods beginning on or after 1st April, 2013. • The Agreement provides for the exchange of documents or information created in or derived from a date preceding 1st April, 2013, that are foresee ably relevant to a request relating to tax years beginning on or after 1st April, 2013. Notwithstanding pledges to take the bilateral relationship to a new level, PM Manmohan Singh in his first meeting with new Chinese President Xi Jinping has sought a joint mechanism to assess the construction work on dams on Brahmaputra river in Tibet. "I took the opportunity to raise the issue of trans-border river systems. I requested the Chinese government to provide a joint mechanism to enable us to assess the type of construction activity that is going on in the Tibetan Autonomous Region (TAR)," he told reporters accompanying him on his return today from a four-day visit to Durban in South Africa. He was asked about the discussion on the water issue he had with Xi in Durban last night on the margins of the BRICS summit in the first-high level face-to-face contact between the two countries after the change of power in China. President Xi assured him that China was quite conscious of their responsibilities and the interest of the lower riparian countries, the Prime Minister said. As regards the specific mechanism that he had asked, the Chinese President told him that they would further look into it. The Prime Minister taking up the construction work in the Tibetan region assumes signficance in the context of the Chinese proposal to build three dams on Brahmaputra which has raised concerns in India. Officials have earlier talked about a joint mechanism but this may probably the first time the Prime Minister has spoken about it and that too at the highest level. "But as of now, our assessment is that whatever activity that is taking place on the Brahmaputra region in Tibet, it is essentially a run-of-the-river projects and therefore there is no cause of worry on our part," Singh said. On his meeting with Xi, the Prime Minister said it was the first meeting between them and both agreed that they would continue to maintain the strong tradition of frequent high-level exchanges between the two countries to strengthen the ties. We also agreed that high-level visits will be exchanged this year between India and China. I look forward to the opportunity of an early meeting with the Premier of China as well," he said. Asked about his assessment of the new Chinese leadership, Singh said even before the formal meeting yesterday he had had "productive exchange" of views with Xi on the sidelines of the BRICS Summit. He said both of them agreed to continue the exchanges that the type of intimate exchanges that used to take place when President Hu Jintao and Premier Wen Jiabao were holding their positions. "Both of us agreed that we should aim to maintain similar relationship under the new leadership of China." He said the two leaders last night reviewed the entire gamut of the bilateral relations and discussed the opportunities for exchange of views in cooperation and coordination in regional and international fore. Asked about five proposals made by President Xi last week to strengthen bilateral ties with India, Singh said this was his first meeting and both of them were keen to get acquainted. "While we reviewed a whole gamut of relationship, we didn't get to specifics. I got a distinct impression that the new Chinese leadership is serious as the former leadership to promote good neibhourly relations and to find practical and pragmatic solutions to outstanding issues between our two countries," he said. Greetings from Lama Desert Tourism Dubai !!!! Trust this mail finds you well ! Please find enclosed the E-invite for The LAMA Road Show 2013 at The Hotel Le Meredien, Windsor Place, Janpath,New Delhi on 08April2013 (Monday;1800hrs onwards). The Lama Road Show will showcase some of the best Hotels & Service Providers in the UAE and who have worked very closely with Lama to ensure your Clients & Guests have a memorable time in Dubai; Abu Dhabi etc. I kindly request you to BLOCK 08April, 2013 in your busy schedule. Syria is in a state of crisis. More than 70,000 people have been killed—over 3,700 are children—since the conflict started two years ago. President Barack Obama made stopping mass atrocities a priority and a "core national security interest.” Yet U.S. efforts to slow or stop the crisis in Syria—diplomacy and sanctions against the regime, primarily—have had little effect. We need a new approach: the United States must cut off the supply chains that provide Assad the resources his regime needs to commit atrocities. This includes weapons, troops, and access to money provided by Iran and Russia, among many other actors. Urge President Barack Obama to stop the supply chain to Syrian atrocities! We have been tracking Assad’s supply chains since the conflict spiraled and found that the United States is well positioned to disrupt it. Secretary of State John Kerry visited Iraq recently and told Prime Minister Nuri Kamal al-Maliki that Iraq must stop Iran from shipping arms to Syria through Iraqi airspace. This is a good step. But stopping Assad’s enablers of mass atrocities requires a multi-prong approach. The United States can do much more. Syrian casualties are mounting. Failure to act now to cut off these supplies will lead to even more bloodshed and will send the wrong message to those fueling Assad’s atrocities. The US Congressman extended an invitation to Gujarat Chief Minister Mr Narendra Modi to visit United States of America soon. The C.M accepted their invite promptly and smilingly. The issue of visa was never discussed in the meeting. It is important to state that in recent years, this is the highest point of contact between the US elected Officials and the Chief Minister of Gujarat stated OFBJP leader Mr Jolly. To promote people to people contacts & diplomacy and under Global Community Over reach program, the US based NIAPPI led by its Chairman Mr Shalabh Kumar and India based Delhi Study Group led by BJP Convenor Overseas Affairs Mr Vijay Jolly joined hands to make this program a grand success. 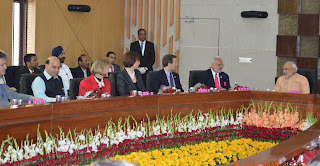 People in India and US worked hard for more than 14 to 15 hours a day for this global connectivity to happen and public diplomacy to succeed stated OFBJP leader Mr Vijay Jolly at Gandhinagar, Gujarat. 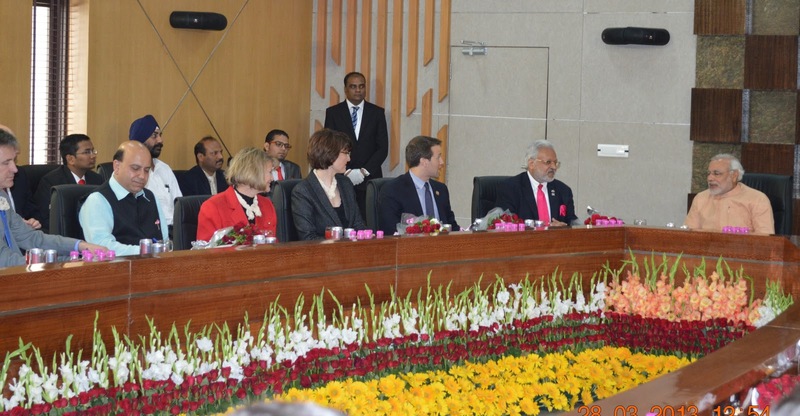 A video presentation on the state of good governance in Gujarat was shown to the US guests. The success story of Gujarat infrastructure development, the state of power surplus in Gujarat, inclusive phenomenal growth rate in Gujarat, 25% contribution of Gujarat in overall exports of India, round the clock electricity supply in rural & urban areas in Gujarat, 100% internet connectivity at primary school level in Gujarat, enactment of SIR Act of 2009, the dedicated 1483 kilometers long freight corridor from Dadri to JNPT, Gujarat ect were showcased to the visiting US political & business leaders. The CM Gujarat Mr Narendra Modi presented bouquets of roses to all the delegates. Tea, coffee, cold drinks, vegetarian sandwiches and cashew nuts were offered to the guests in the meeting. Gujarat Chief Minister Mr Narendra Modi expressed concern on cross border terrorism emanating from Pakistan and resulting in bomb blasts killing thousands of innocent Indians in various states of India. Issues relating to environment, power generation, identifying alternate sources of energy, strengthening democracy and increased participation of US private sector investments in infrastructure-development sectors were roundly discussed in the meeting stated OFBJP Convener Mr Vijay Jolly. Latter a Press Conference was addressed at Ahmadabad by Mr Shalabh Kumar, Mr Aaron Schock, Mr Vijay Jolly, Mrs. Cathy M. Rodgers and Mrs Cynthia Lummis where heaps of praise and admiration for Mr Modi and his style of Good Governance were expressed . Putin Russian president, keen for his nuclear technology to be spread across North and southern hemisphere thus looks for his project start up with comforts for more can be taken up the line ups. Quoting my(Naresh Kumar Sagar) opinion on substance of energy,Energy hot pot subject for Indians, is necessity in fast pace world economy needs everyone's attention. Energy is at crossroad to change its form in many forms, once this energy takes its commoner form it will merciless on the heavy industry, total economy to get into next orbit of minute particles or now known as nano tech. Naresh Kumar Sagar further adds,"What are the alternates which can bring the fast turn around are simpler form of energy from plants,roots,herbs,hydrocarbons,Solar,bio fuel, Wind,Gases,H,Oxy Nitrogen, Oil and Cakes ,Sewer with modifications and converging chemistry and physics to give them space with electrons. Preparation of solid fuel from gaseous to handle with ease and keep as energy store.Minutely observing the energy path of its development makes us belief energy by all energy for all energy with all will change the style of the man." Replying to Putin Russian president question on Kudankulam Unit I of the atomic power reactor in Tamil Nadu will become operational by next month, Prime Minister Manmohan Singh said.He gave this assurance to Russian President Vladimir Putin when the two met on Tuesday night on the sidelines of the BRICS summit. "I am pleased to inform you that Kudankulam I will become operational and critical by next month. As for Units III and IV we have secured all internal approvals and we hope to operationalise our cooperation on Unit III and IV," Singh told Putin.Singh was accompanied by Finance Minister P Chidambaram, Commerce Minister Anand Sharma and National Security Adviser Shivshankar Menon among others during the meeting. Kudankulam atomic power plant has been rocked by a major controversy with villagers in and around Kudankulam in Tiruneveli district carrying out prolonged protests against the commissioning of the atomic power plant. The protests got intensified after the Fukushima disaster in Japan last year. On bilateral economic cooperation, Singh said the two countries cannot be satisfied with the status quo. Singh said that India did not miss any opportunities for meeting the Russian President. He said India was satisfied with the pace of the programme of communication and cooperation between the two countries. "I have instructed National Security Adviser to keep in touch with the NSA of Russia and those who are responsible for the strategic programme," he further said. The PHD Research Bureau in collaboration with Indian Direct Selling Association published the Annual Survey 2011-12 for the Indian direct selling industry and the report was released on March 22, 2013 at Hotel Oberoi, New Delhi by Ms. Ganga Murthy, Principal Advisor, Department of Consumer Affairs, Government of India. The Indian direct selling industry has been beating the economic slowdown, notching up remarkable growth over the years and has been expanding its horizons in India as a rapidly emerging alternate distribution channel. The direct selling industry has grown at 22% during 2011-12, with its sales revenue expanding from INR 52,294 million in 2010-11 to INR 63,851 million in 2011-12. The robust growth in the segment has been contributed by 22.5% growth in the organised and 17.7% growth in the unorganized segments of the industry during 2011-12. The industry grew from INR 33,226 million in 2008-09 to the present level of INR 63,851 million in 2011-12. The concentration of sales revenue of direct selling industry in the Southern region has now started shifting to the other regions of the country. Due to large unexplored markets and emerging growth opportunities, the direct selling firms are now looking towards the vast consumer market for their products in the Northern and North eastern regions too. The survey revealed that the share of Northern region in sales revenue moved from 15% in 2010-11 to 20% in 2011-12 and on the contrary, the share of Southern region in sales revenue has declined from 44% in 2010-11 to 38% in 2011-12. The share of Eastern region increased marginally from 14% in 2010-11 to 15% in 2011-12, while the share of north-east increased from 7% in 2010-11 to 10% in 2011-12. However, the share of western region declined from 20% to 17% during the same period. Regional sales figures suggested that South contributed to INR 24,264 million to the gross sales revenue in 2011-12 while North contributed to INR 12,770 million. The West region contributed to INR 10,854 million, whereas the gross revenue generated by East region stands at INR 9,578 million followed by North East at INR 6,385 million. It is interesting to note that during 2011-12, the Northern region has exhibited remarkable growth at around 56% while North Eastern region has grown robust at 37%. The Eastern region grew at 32%, whereas, the Western region grew at 19%. However, the Southern direct selling market has decelerated at -2%. The direct selling industry has contributed significantly to self employment generation over the years, and the momentum has been kept up this year as well. The total distributor base of the Indian direct selling industry during 2011-12 stands at 48,53,232 out of which 39,80,016 distributors are employed by member companies, whereas, 8,73,216 distributors are employed in the non-member companies. The growth of total distributor’s network stands at 22.5% in 2011-12 over 2010-11, contributed by 24.2% growth among member companies and 15.2% growth among non-member companies. The share of women has always been more than 50% of direct selling distributor base in India. However, with rising cost of living especially in metro cities, Indian men are also looking up to this sector as an earning opportunity, as the consumption expenditure has swelled up over the years. The share of men (direct sellers) increased from 36% in 2010-11 to 37.5% in 2011-12. Out of the wide variety of products sold through the organised direct selling industry, products related to wellness contributed to the highest share of sales revenue at about INR 27,455 million (44%) while beauty/ cosmetics and personal care products at around INR 21,071 million (33%) were also very high in demand. Among other categories of products which have attracted the customers are home care and home improvement products with a gross sales revenue of INR 8,939 million (14%), consumer and household durables with INR 3,831 million (6%). Other products and food and beverages capture 3% and 1% of total sales revenue in the industry at INR 1,916 million and INR 639 million respectively. According to the survey the main drivers of growth in this sector are high quality standards of products, brand name, reliability/durability, promotional measures and good demonstrations. The total taxes paid as reported by the IDSA member companies including both direct tax and indirect tax amounted to INR 8,212 million posting a growth of about 27% in 2011-12 over INR 6,470 million in 2010-11. The percentage of total taxes in total sales revenue generation has also increased from 21.5% in 2010-11 to 21.8% in 2011-12. It is interesting to note that despite the intensifying global economic crisis which is looming large across the world economic scenario and the persistent slowdown in Indian economic growth vis-à-vis deceleration in industrial output, the direct selling industry has shown considerable resilience, sustaining steady growth over the years. It is evident from the fact that only a marginal decline in growth of sales revenue was noticed in 2011-12 at 22% from around 27% in 2010-11 due to slowdown in consumption demand. It is indeed encouraging to find that the direct selling industry has firmed its ground in the economy and with growing value perception of consumers, awareness about the product range, increasing accessibility to products and growing demand in the smaller towns, the industry has enormous potential to enhance its market presence in the coming times. Going ahead, growth prospects of the industry are bright which is set to take off, driven by strong consumer base and expanding markets. The survey revealed that industry was positive about the robust growth of the direct selling industry in the coming years. Respondents felt that the size of the industry is estimated to leap-frog by 2014-15 scaling upto INR 1,08,436 million from the present level INR 63,851 million. Though the growth of the industry vary across its different segments like organized and unorganized sectors, however, overall the industry is slated to grow at an average of more than 20% in the next three years by 2015. Further, they felt that in the long term, over next three to seven years by 2020, industry could consolidate its position across the corners of the country and grow at an average rate of 25% scaling up to INR 3,40,000 million. Patna/New Delhi: In response to Bihar Chief Minister’s promise of ‘puncturing’ hazardous asbestos factories in the fertile State in the meeting with the leaders of Vaishali’s Khet Bachao Jeevan Bachao Jan Sangharsh Committee (KBJBJC) and the leaders of left parties on February 13, 2013, Utkal Asbestos Limited (UAL) Industries Ltd has filed a case against the State Government. The case was filed on March 4, 2013 in the Patna High Court. The case is scheduled for hearing on April 4, 2013 before Mr. Justice J.N.Singh. It may be recalled that Justice (Retd) Rekha Kumari, Patna High Court has contended that companies which willfully expose human beings to cancer causing fibers of asbestos must be made criminally liable because right to health is part of right to life in a public lecture on December 24, 2012 at A N Sinha Institute of Social Studies, Patna. Her hand written legal opinion is available with the ToxicsWatch Alliance, which has been campaigning for national ban on lung cancer causing on asbestos products following its ban in over 50 countries. It is noteworthy that Bihar Chief Minister Nitish Kumar met the leaders of ban asbestos movement met the leaders at his residence at 1, Anne Marg in Patna in the evening hours of on February 13, 2013. The Chief Minister expressed outrage at the granting of ‘No Objection Certificate’ by Bihar State Pollution Control Board (BSPCB) to hazardous asbestos based factories in fertile agricultural lands. In a remarkable move Bihar Chief Minister phoned Chairman, BSPCB and fixed an appointment for the villagers of Vaishali for February 14, 2013 and expressed his disapproval for asbestos based factories to him in front of the leaders of the left parties and the villagers’ committee. Following the meeting with the villagers and Chief Minister’s directions, BSPCB officials visited the factory site on March 4, 2013 as part of the process to cancel the approval given to the asbestos company’s plant. After the villagers Mahadharna of June 14, 2012, the district administration had put a stay on the construction of the factory. When the construction started again on December 16, 2012, the villagers blocked the Mahua-Samastipur road for 9 hours to express their protest against the proposed white asbestos plant of UAL company in their village on June 14. Cancer causing white asbestos also called chrysotile asbestos is banned in 55 countries. Asbestos Virodhi Nagrik Manch, Patna and left and socialist parties participated in the demonstration on January 16, 2012 to express solidarity with the villagers struggle against the asbestos based factory of Utkal Asbestos Limited. Now that the construction of asbestos based factory in Vaishali is all set to be permanently stopped, the issue of three asbestos plants in Bhojpur’s Giddha and Bihiya has come to the forefront where protest has been going on for more than 2 years. Notably, the Giddha plant is situated behind a B Ed College. The villagers are protesting against this plant. In Bihiya, Tamil Nadu based Ramco Industries is operating two asbestos plants amidst protests from villagers although it has permission for only one. Memorandum has been submitted to the District administration and BSPCB in this regard. The memorandum to the Chief Minister demanded white asbestos based plants should be closed in public interest keeping public health in mind and dismissal of fake case registered by Utkal Management. ToxicsWatch Alliance demands that following Chief Minister’s intervention Bihar’s State Investment Promotion Board (SIPB) and the State Cabinet must disapprove asbestos based industrial projects and rescind earlier approvals. Former judge of the Rajasthan High Court Justice Sajjan Singh Kothari was sworn in as Lokayukta on Monday, Governor Margaret Alva administered him oath of office in the presence of Chief Minister Ashok Gehlot. Chief Justice Amitava Roy, members of council of ministers, BJP State President Vasundhara Raje and senior officers were present during the ceremony at Raj Bhawan in Jaipur on Monday. The post had been lying vacant since May last year after the retirement of G L Gupta. Kothari’s selection was made by a panel that included the Chief Minister, Leader of Opposition and the Chief Justice of Rajasthan High Court. Dozens of houses and a mosque have been torched as communal violence spread in central Myanmar, officials said on Sunday, adding scores of people have been arrested over the unrest. “Altogether 43 houses and a mosque have been burned last night (Saturday)… most of the houses belong to Muslims,” a ward official in Yamethin town, near the capital Naypyidaw told the news agency, adding no-one was injured in the unrest. The Information Ministry said 52 people were arrested with weapons and 13 held in Meiktila town, where lethal riots last week left at least 32 people dead and thousands displaced. Police also made more arrests at two other villages as trouble between Buddhists and Muslims spread, the information ministry said in a statement. On a visit of the riot-stricken town where the violence began last Wednesday Vijay Nambiar, the UN special adviser on Myanmar, expressed sadness at the death and destruction but said residents want to rebuild their shattered lives. The clashes are a stark reminder of the challenge which worsening Muslim-Buddhist tensions poses to Myanmar’s quasi-civilian regime as it tries to reform the country after decades of iron-fisted military rule. The flare-up of violence is the most serious religious conflict since Buddhists and Muslims clashed in the western state of Rakhine last year, leaving at least 180 people dead and more than 110,000 displaced. The Union Finance Minister (FM), Shri P. Chidambaram, said that India with its focus on inclusive development and timely interventions has been able to weather the global crisis better than most other countries. He said that with liberalization of FDI in certain areas and slew of other steps, we have travelled a considerable distance on the road of economic reforms. Shri Chidambaram said that the need of the hour is to ensure that these reforms are implemented efficiently so that the anticipated upturn in GDP growth is achieved in as short a time as is practicably possible. Shri Finance Minister, Shri Chidambaram was speaking after inaugurating the National Editors’ Conference here today. The two day Conference is being organized by Press Information Bureau (PIB), Delhi. The Conference was attended among others by about 50 representatives of regional and vernacular media from different parts of the country alongwith local media persons. The Inaugural Session of the Conference was also attended by Shri R.S. Gujaral, Finance Secretary, Shri Uday Kumar Verma, Secretary, Ministry of I&B, and Ms. Neelam Kapur, Principal Director General, PIB alongwith senior officers of Ministries of Finance and Information and Broadcasting.The Finance Minister, Shri Chidamabram said that the reforms are on-going process and far reaching changes have been made in the macro-economic and sectoral policies since 1991. He said that the Government has introduced a series of reforms to improve and sustain the investment climate in the country as well as to make growth more inclusive. These include liberalisation of FDI in multi brand retail, civil aviation and broadcasting, rationalization of diesel and other petroleum prices including capping subsidized LPG cylinders to consumers. With introduction of direct benefit transfer (DBT) through Aadhar, introducing Competition Commission of India (Amendment) Bill, 2012 in Parliament; reducing the rate of withholding tax to enable low cost foreign borrowing by Indian companies; legislative measures in the banking sector paving the way for granting new bank licenses by the RBI, setting up of Cabinet Committee on Investment for fast tracking mega projects of over Rs. 1000 crores and approving the scheme for financial restructuring of State Distribution Companies (DISCOMs) by Cabinet Committee on Economic Affairs (CCEA). Besides this, other reforms are also being considered. The Financial Sector Legislative Reforms Commission (FSLRC), which was examining the laws governing the financial sector, has submitted its report yesterday and the report will be put in public domain in the next few days, said the Finance Minister. The FM said that several fiscal and administrative measures to rein in inflation and steps to reduce the fiscal and current account deficits are also being taken. He said that current account deficient and fiscal deficit are distinct in the sense that both are financed through different sources. He said that while current account deficit is financed by foreign exchange while fiscal deficit can be financed through domestic savings and earnings. The Finance Minister, Shri Chidambaram announced certain measures for ratioinalisation of foreign investments in Government Securities and Corporate Bonds. In order to encourage greater foreign investment in INR denominated debt instrument and to help develop rupee debt markets, Shri Chidambaram said that the Government will simplify the framework of FII debt limits, the allocation mechanisms of these debt limits and also lay down a plan for enhancement of these debt limits. ii) Corporate bonds of US $ 51 billion dollars (by merging US $ one billion for QFIs, US 25 billion dollars for FIIs and US $ 25 billion for FIIs in long term infra bonds). The Finance Minister said that because of the room created by unifying categories, the current SEBI auction mechanism allocating debt limits for corporate bonds will be replaced by the ‘on tap system’ currently in place for infrastructure bonds. He said that in order to allow large investors to plan their investments, the Government will review the foreign investor limit in corporate bonds when 80% of the current limit is taken up. He said that it will also enhance the limit on government bonds as and when needed, based on utlilisation levels, demand from foreign investors, our macro-economic requirements and a prudent off shore:on shore balance. To provide a guide to investors, the FM said that the annual enhancement of the Government bond limit will remain within 5% of the gross annual borrowing of the Central Government excluding buy backs. The Finance Minister Shri Chidambaram said that these changes will be made operational by April 1, 2013. The Finance Minister said the budget proposals of 2013-14 have a number of incentives for Government which include tax deduction of investment allowance for companies making an investment of over Rs. 100 crores in plant and machinery, zero custom duty for plant and machinery for manufacturing electronic semi-conductor wafer fabs and availability of non-tax benefits to micro, small and medium enterprises (MSME) for three years even after they graduate to higher category. The Finance Minister further said that in an emerging economy like India, rapid economic growth is one of the most important economic objectives. He said that economic growth though important can not be only an end but is also a means to an end. He said that it allows to generate the resources to achieve more equitable development and a wider distribution of the opportunities, development offers so as to attain higher standards of living for the masses. Equally important is the need for effective bridging of regional, social and economic disparities and empowerment of the poor and marginalized, specially women to make the entire development process more inclusive. The Finance Minister said that the 12th Five Year Plans sub-title “Faster, More Inclusive and Sustainable Growth” puts the growth debate in the right perspective. The Government’s targeted policies for the poor with fewer leakages can help in translating higher outlays into better outcomes especially after implementation of Direct Benefit Transfer System. The Finance Minister, Shri Chidambaram said that India has the opportunity to grow at a brisk rate for many more decades. He said that it is on the brink of a demographic transition with the proportion of working age population between 15 and 59 years likely to add approximately 63.5 million new entrants to the working age group between 2011 and 2016, the bulk of whom will be in the relatively younger and productive age group of 20-35 years. He said that given that India is one of the youngest large country in the world, human development assumes great economic significance for it as demographic dividend can be reaped only if this young population is healthy, educated and skilled. He said that by giving our people the right skills, tools and the right jobs, we can increase the value that they add for many years to come. He said that by moving excess people out of agriculture to higher productivity sectors such as services and industry, we can have a growth machine that can produce brisk growth for many years, creating higher incomes and improved livelihoods. The FM said that to make all this happen, we need to create more high productivity jobs as well as opportunities in organised manufacturing and in services sectors even while improving productivity in agriculture. No country has become middle income or developed country without a strong manufacturing base, the FM added. The FM said that despite the limitations in fiscal space, the programmes aimed at human development have never been allowed to suffer on account of paucity of funds. He said that this is also evident from the fact that as a proportion of the GDP, expenditure on social services increased from 5.91% in 2007-08 to 6.79% in 2010-11 and further to 7.09% in 2012-13 (BE). He said that while expenditure on education as a proportion of GDP has increased from 2.59% into 2007-08 to 3.31% in 2012-13 (BE); while on health it has increased from 1.27% in 2007-08 to 1.36% in 2012-13 (BE). The FM said that the central outlay for health in 12th Five Year Plan has been increased by 200 per cent to Rs. 3,000,18 crore compared to the actual outlay of Rs. 99,491 crore in the 11th Five Year Plan. In line with the Government’s commitment to “faster, more inclusive and sustainable growth”, the Union Budget 2013-14 has earmarked enhanced resources for all major social schemes. The FM said that adequate funds have been provided in the budget to every Ministry/Department including for Bharat Nirman programmes. He said that National Food Security Bill is a promise of the UPA Government. He hoped it will be passed soon by the Parliament. An amount of Rs. 10,000 crores has been set apart, over and above the normal provision for food subsidy, towards the incremental cost that is likely under the act, he added. The FM said that we have a collective responsibility to ensure the dignity and safety of women. He said that Criminal Law (Amendment) Bill, 2012 has already been passed by the Lok Sabha and Rajya Sabha. Shri Chidambaram said that a fund called as ‘Nirbhaya Fund’ is also set up with the Government contribution of Rs. 1000 crores for providing instant relief to the women victims of atrocities. The FM said that a number of legislative steps have also been taken by our Government to guarantee rights to people like the Right to Information, Right to Work through the Mahatma Gandhi National Rural Employment Guarantee Act (MGNREGA), the Forest Rights Act and Right to Education among others. He said that, however, there are also pressing issues like leakages and funds not reaching the targeted beneficiaries. The FM said that we have recently launched Direct Benefit Transfer (DBT) system with the unique ID system Aadhar can help in plugging many of these leakages and ensure that money from Government schemes reaches the right beneficiaries on time and in the full amount through their bank accounts. He said that it will help translate outlays into better outcomes by improving service delivery, accountability and transparency in the governance of various schemes and also accelerate financial inclusion. He said that we have already made a start in 43 districts in Phase-I and committed to the time bound implementation of the DBT system across the country. The FM said we have reached a decisive phase of economic rebuilding and today, we as a nation are more confident in dealing with the global challenges posed from time to time. He said that a resurgent India, having earned its place among major economic powers of the world, confidently looks forward to a brighter future. He said that we are steadily but surely working on the next generation of reforms. The FM said that the immediate challenge, however, is to consolidate the economy to return to path of higher growth rate while ensuring that gains of growth reach more and more people.